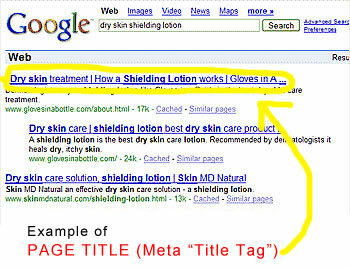 Our last post discussed why do you need great blog post meta title tags. This post is focused on why do you need great blog post meta descriptions? Both the title tag and the description of your post contribute a great deal to the SEO ranking of your web page in the search engine results. Make them great, along with well chosen keywords and your web page will rank well in the search results which is the first step in have an actual human being look at your content. You want to be in the first page of search results and preferably above the fold so that readers will review your listing and make a decision to click on your web page vs. someone else. Use your keywords in the description, but have them make sense as well. Avoid keyword stuffing, this turns the search engines off as well as readers. Content management systems like WordPress will automatically create your meta description tag for you. They use the first few words of your post. You can also manually create them as well. However in both cases make sure they are of high quality. They should describe the content of your post in a few words to entice the reader to click on your post. This brings us to the second reason why do you need a great blog post meta description. Readers have lots of information available to them. There are millions of competing websites. You want to make your summary, description or snippet as they are sometimes called as attractive as possible. Are you solving the readers question? If he or she clicks on the post, will they get the answers they are looking for? Always focus on high quality content using the keywords you are focused. Avoid keyword stuffing. This can make the content look unnatural and difficult to read or even make sense of. There are two fundamental reasons to write good titles for your blog posts. Why do you Need Great Blog Post Meta Title Tags and why are they so important? In order of importance, they probably rank in terms of SEO first and human reader second. From an SEO perspective, the title tag is one of the most important elements in the ranking of pages. It describes your post and should contain all of the keywords that you are aiming for. The title should also be included in the first couple of paragraphs on your page. The title or at least the keywords should be also included in paragraph headings later on in the post. Your objective is to show to the search engines what keywords you are focusing on. Then follow that up with really great content. Use a content management system such as WordPress. This CMS will automatically place the title of your post in the title tag for you. The second major reason is your customer or reader of your post. The reader or person looking for something on the internet must choose from the results presented. Usually 10, which one he or she will click on. Making this decision is based on your title and how closely it represents what they are looking for along with the meta description that we will cover in the next post. Needless to say, if your title is not well written or does not correspond to what they are searching for, they will not click on your post. Appearing on the first page of search results gives you a one in ten chance of being selected if you ignore the paid advertising. Make the title excellent if you want to improve your chances of being selected. Whatever you do, focus on quality title content and do not stuff the title with keywords that do not make sense.